I was with long time good friend, meteorologist and stormchaser Anthony Cornelius out on Queensland’s Darling downs. 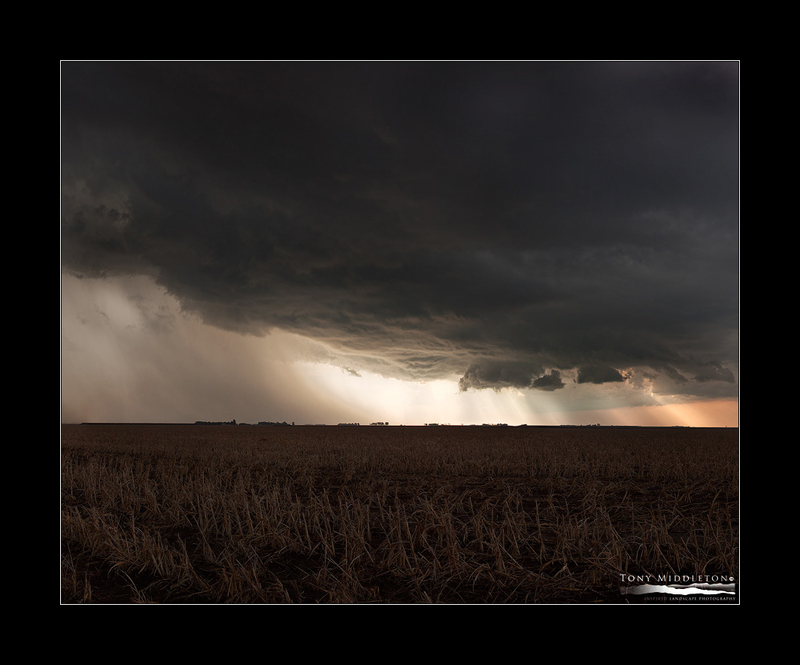 A severe thunderstorm becomes very organised as a rotating wall cloud develops. Quite a scene looking across the agricultural landscape, but not the easiest to photograph with massive light inbalances and the rush of a chase, but worth all planning and effort. ~ by Tony Middleton on October 18, 2011. Indeed it was worth the chase Tone! Great storm clouds, and light in the sky. Really works well together. The foreground works well too with the feeling and the image too. If there was one thing I could nit about, I would like a bit more contrast in the stubble in the field. Just a bit more to give it a bit more pop. Not too much to compete with the sky, just a bit more to bring the image out of the screen a bit more. Thanks Jeremy – they can be tough scenes to work with or even find something to work with when chasing ! You post some great ,scary storm images Tony, keep ém coming! Thanks Stephen – I always enjoy reading your comments mate ! The real drama in this picture is that the storm is approaching those distant copses of trees on the horizon (which probably surround farmhouses). Great shot, Tony. You are spot on as there was a couple of farmhouses over there, which on the full res. file are visible. Thankfully from their perspective the storm didn’t quite get as nasty as it could have. Love this shot Tony, looks awesome.